Please note! This is just the raw display, not attached to a PCB or for use with a breadboard. If you want to use this out of the box with no surface mount soldering, check out assembled 1.8" TFT breakout board. 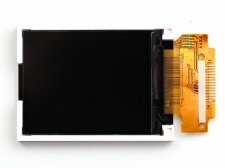 This display is for experts who are comfortable soldering a surface mount display using fine pitch soldering techniques! This display also is for 3.3V use only, so be sure to use a level shifter if you're going to use it with 5.0V microcontrollers.